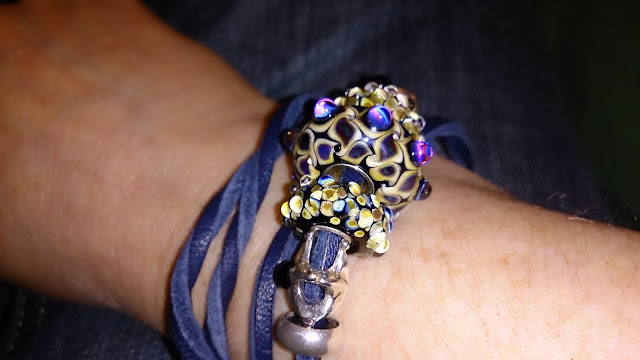 Finally I got around to having some serious bead play with my Luccicare Focal Bead, I knew what I was going to put with it initially as I'd bought my 2nd milan bead especially for this. Libra and Sagittarius Star, Luccicare Bead, Cells. I was really struggling to find enough beads to make a full bracelet and it wasn't quite working, as there weren't as many beads it was quite loose on my wrist and because of the weight it kept swinging upside down. The first time I tried it it was a bit loose, I was chatting online with several friends at the time so mid-conversation I twisted the bracelet and locked it so it was tight; big mistake! I had to stop chatting as I'd cut my circulation off, not a problem thought I, I'll just undo it, no such luck the tension I'd created in the bracelet meant the lock was well and truly "on" and not easily removed with my remaining good hand. Cue a few panicky moments whilst I mentally tried to prepare myself to the prospect of having to cut myself out of my lovely leather bracelet. Some deep breathing and finally some zen like calm descended and I eventually got the bracelet off and made a mental note to not try experimental stuff when in the house on my own. And here's the very first photo I took when I got my new phone, guess what I was wearing that day? This was taken after a very lovely couple of hours sat in my Local Dealers having a cup of tea whilst they all admired my focal bead! Prototype Rocky Beach Kit Leather Bracelet! One more little star... and ta-daaaaa!